Typically we have been almost the only Westerners everywhere we go. 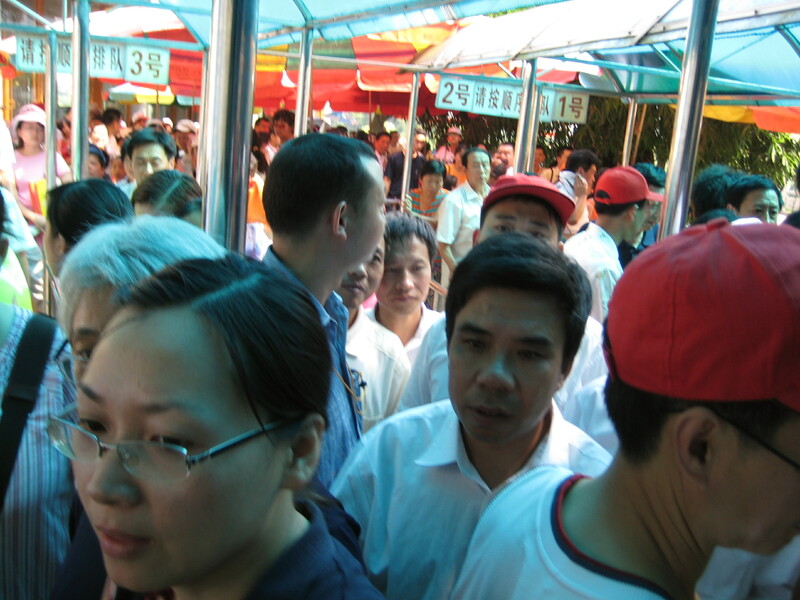 We see people on tours at the major sites, but with the exception of Yangshou we are often the only Western people on the streets or in the restaurants, which means we get stared at a lot. Actually, Justin seems to be quite famous here, people keep coming up and asking to have their picture taken with him, though they seem to want nothing to do with the rest of us. Often, once one person asks for a photo it opens up the floodgates and we occasionally end up with a line of people waiting for their turn for a photo. Every time it happens I also take a photo – we are going to make a whole album dedicated to these pictures. People seem to be mostly fascinated with his hair (curly is certainly an oddity here) and he has been asked multiple times, and mostly by men, if it’s real. Another interesting behavior is that people, again, mostly men, want to pose with their arms linked though his. It’s as if they want to appear to be great friends. This was an altogether unanticipated phenomenon, but a highly amusing one. Unfortunately it was raining much of the time we were there, but it did clear up long enough for us to grab some beer and take a boat ride on the lake. It was a perfectly lovely lake, but I didn’t really get the ‘magical’ bit, something definitely got lost in the translation for us as we were reading about it. After the boat ride was over we wandered around the botanical gardens for a while. This was definitely worth it as there was, a huge variety of plants, many of which I’ve never seen before. For dinner we went to a local restaurant where the specialty was a whole chicken wrapped in Lotus leaves and baked in mud. 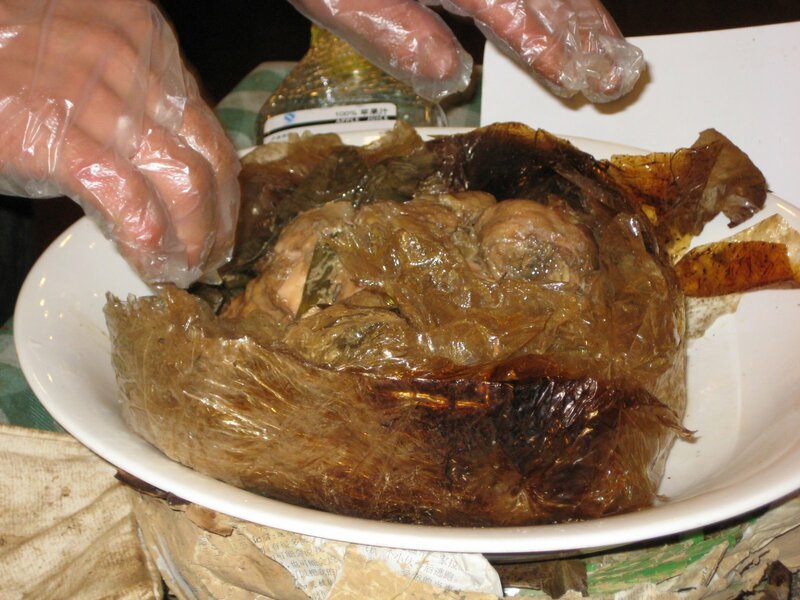 They bring it to your table and unwrap it, hot and steaming, right in front of you. It was very tasty, sort-of like roasted chicken. As it was still raining the next morning we opted to visit a few of the local temples. 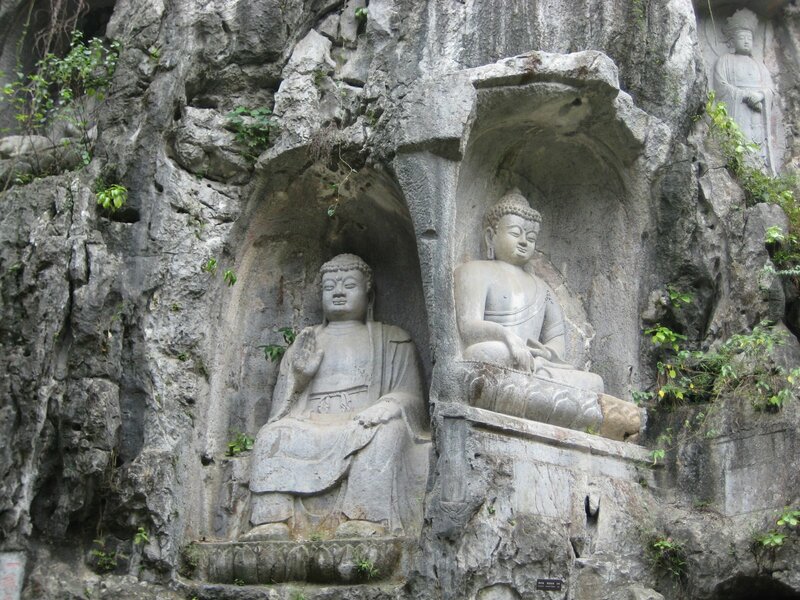 As usual, a calm experience marked by many Buddha figures. A good side trip overall, though I’m sure it would be better without the rain, we had been very much looking forward to visiting the tea field. I’m sure I’ve mentioned it, but it is really hot here. 100 degrees or more hot plus humidity. Just keep that in mind. This is exactly why we got the guide. We would never have figured out where to go! 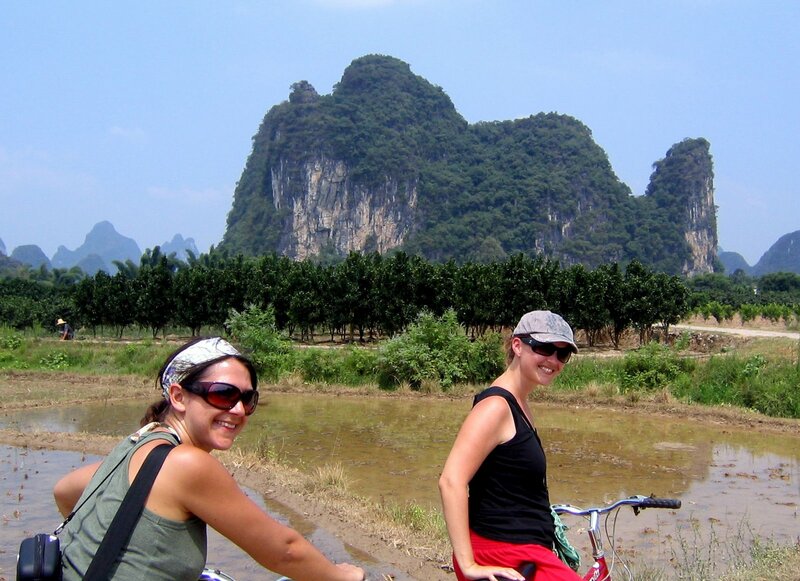 On the third day in Yangshuo we decided that the best was to see the area was to rent some bikes and cruise around the countryside. We hired a guide for the day because the roads aren’t marked and you can get lost really easily. We started off early in the morning to beat some of the heat, which was a good idea and we were able to ride for a few hours without getting too roasted. 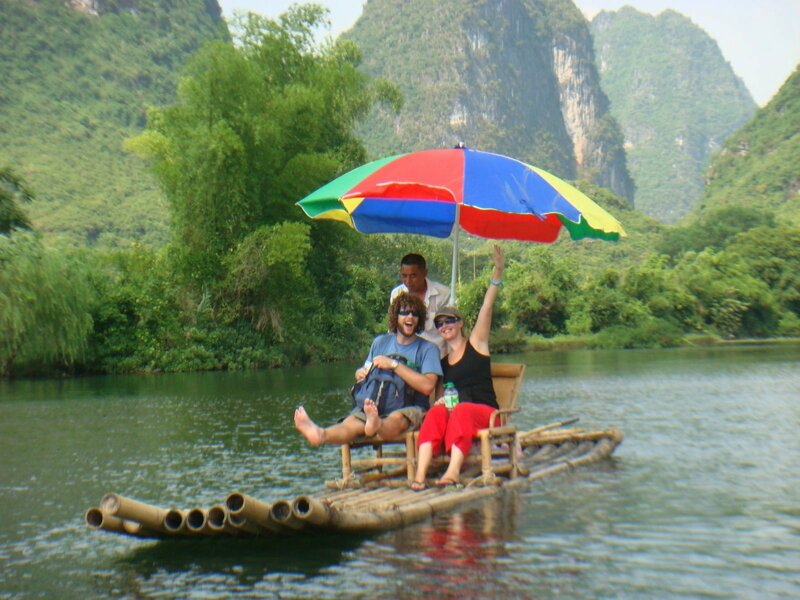 Part of the plan was to take a break after a bit and cruise down the river on bamboo rafts. Touristy? Yes. Did we care? No. 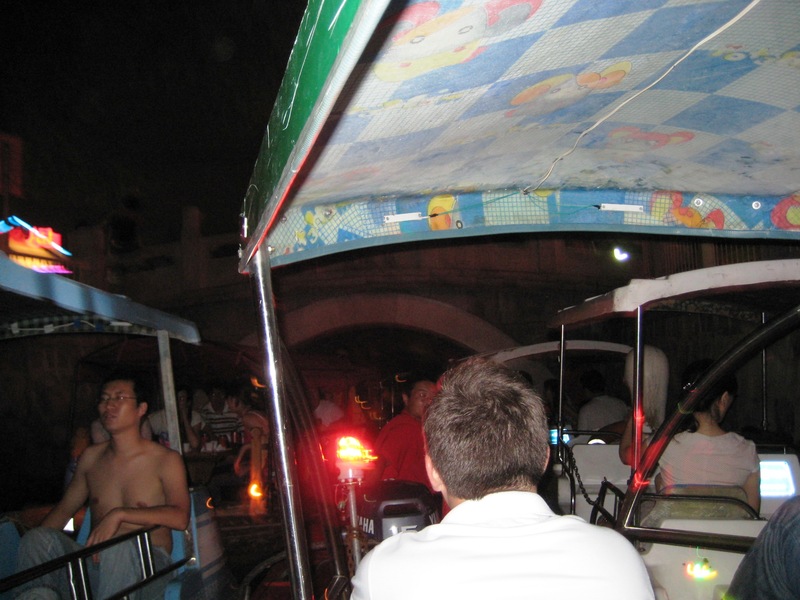 The guide arranged for our bikes to be picked up and we hopped on the shaky rafts that had two seats and a big umbrella. The river was super mellow and we just basically cruised along looking at the scenery and hanging out. You don't need to pay for photos when you have friends on adjacent rafts. Every once in a while we would pass floating stands that had beer, water and some meat on a stick for sale. We also passed a couple of places where they had rigged up computers/printers on rafts and they would take your picture and print you out a copy right there. These were always right near the places where there was a drop in the river (not sure what it was, like a little dam or something that we had to go over) so the pictures looked like you were coming off a little waterfall. We declined to get one, but I was impressed they had managed to hook that up in the middle of a river. At the end of the raft trip we were met by the guide and our bikes and we continued on our way. It was a two-hour ride back to the town and at this point the temperature was easily over 100. 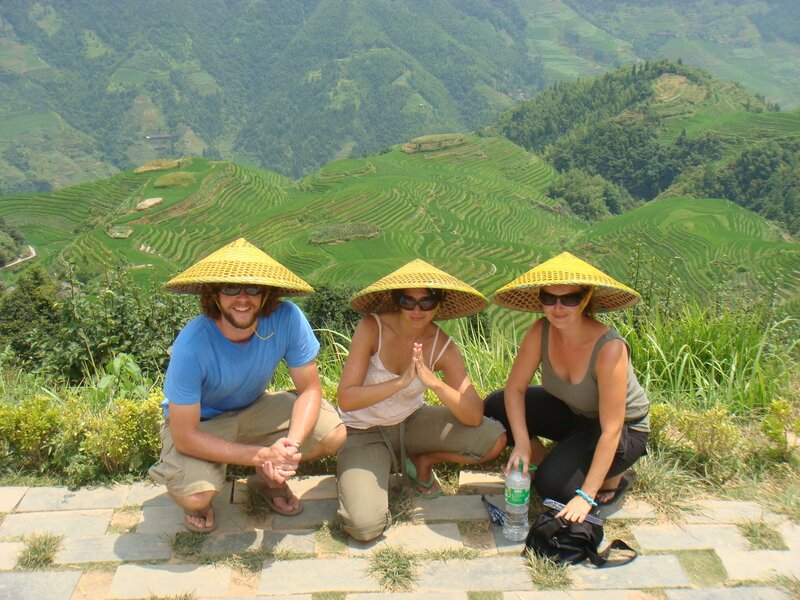 We were on little bitty dirt roads that had no shade but it was amazing – rice fields and mountains all over the place. There were also locals that wanted you to stop and give them a few RMB to take a picture with their water buffalo, which we finally gave into just because they were under the only tree we’d seen in over an hour. At one point we stopped in a tiny town to get some water and rest for a bit. Naturally this was a huge spectacle and within a few minutes half the town and their kids were milling about this tiny little store staring and giggling and attempting to say hello. It was pretty funny, the kids spoke a few words of English and one little girl took me around the back to show me all the snails she caught earlier that day in the river. When we finally made it back to the hotel (did I mention, Morning Sun Hotel, pretty decent, great location) I thought I was going to pass out. I have never been so sweaty in my entire life. It looked like had been rained on. I basically got in the shower, clothes and all, turned on the cold water and let the water bring me back to my normal temperature. After resting a bit Justin and I went for dinner at the Twin Peaks Cafe (West Street) and had the best Chinese meal I’ve had since I ‘ve been here. 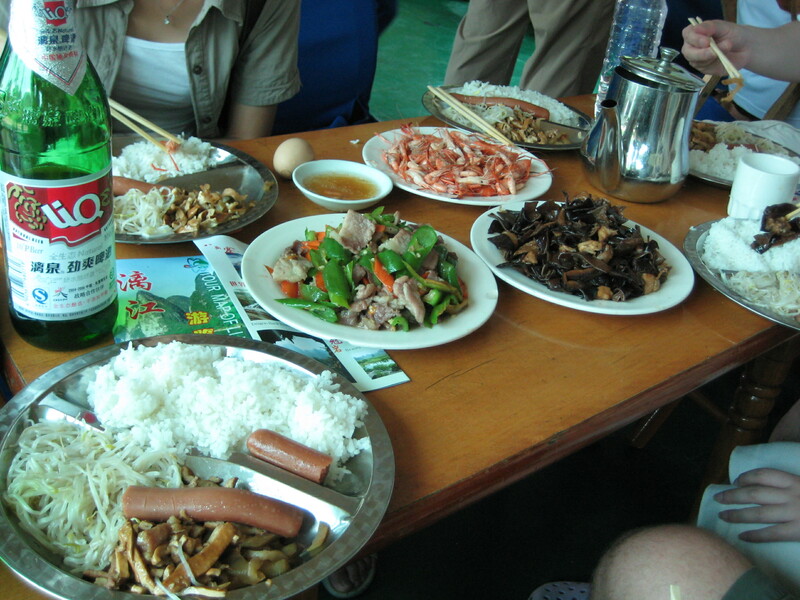 Good portion size, no bones (this is huge, we had bone fragments in nearly every meat dish we encountered) and loads of veggies. 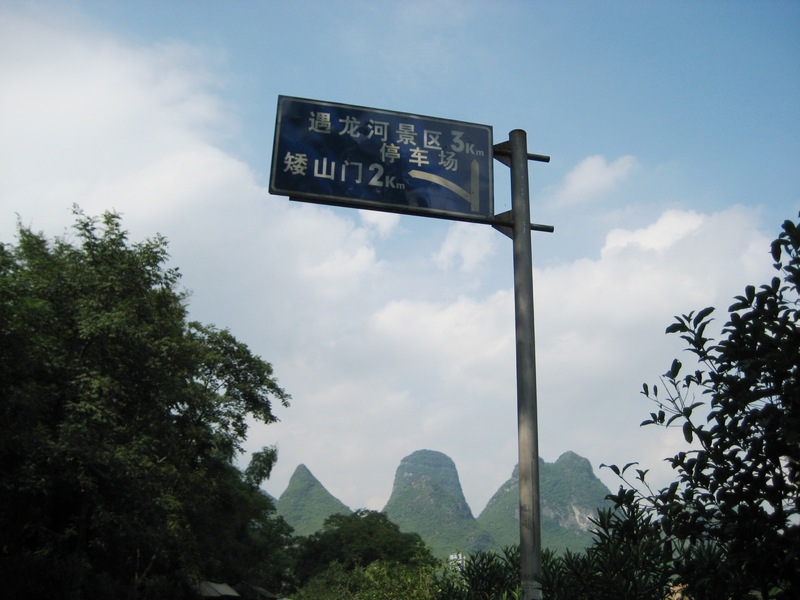 Yangshuo is a backpackers paradise stop. There are a ton of Western restaurants that serve cheap and decent food – you can get real eggs and toast in the morning instead of boiled duck egg, which quite frankly I never managed to develop a taste for. Many people speak English, and there are a million things to do. 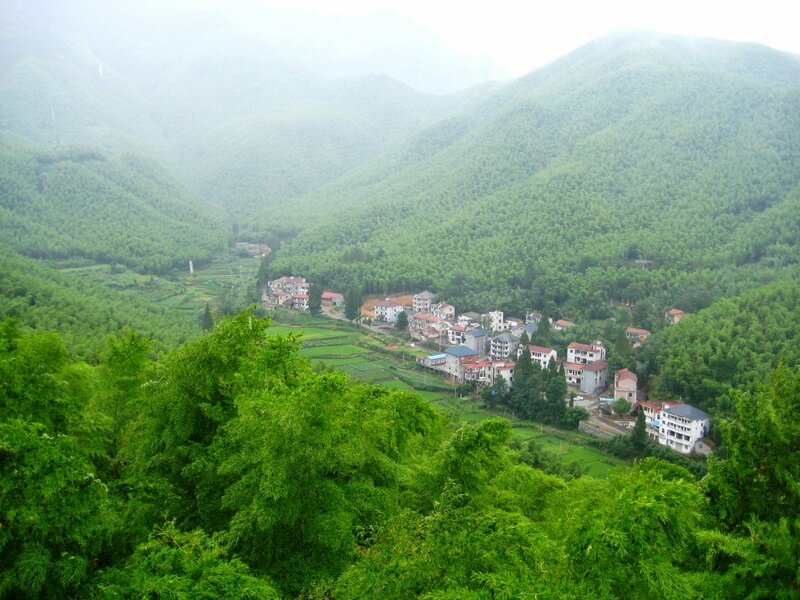 The town is nestled in the middle of the mountains, so there’s a big hiking, biking, rock climbing, rafting scene. 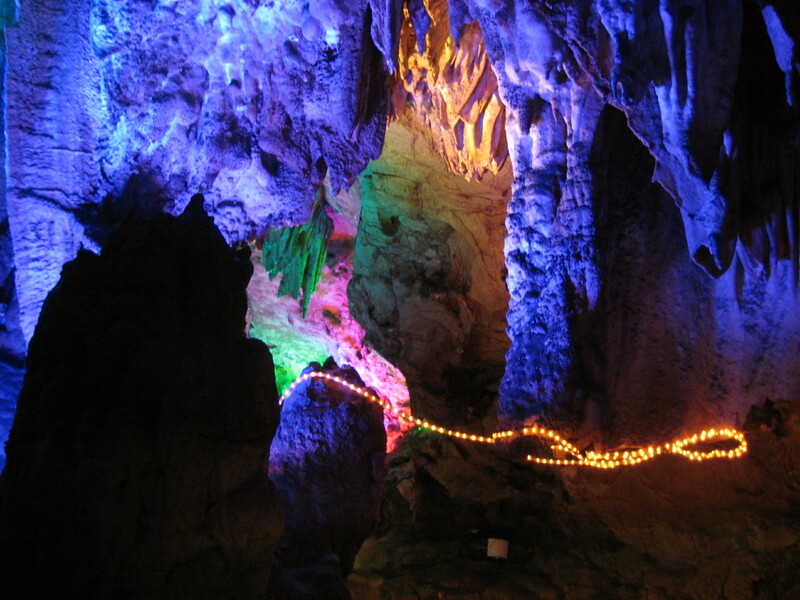 There is also an abundance of caves that you can visit. We decided to go check out the Silver Cave, it got great reviews and seemed like it might let us escape the heat for at least part of a day. To protect the delicate structure of the cave, you have to go with a guide in a group. This is not our favorite way to see the sights, but in this case it was unavoidable. It took about an hour to get to the caves and once there we realized this was going to be a huge tourist debacle. There were tons of people and you had to filter into winding, roped off lines like at an amusement park. Somehow, despite all the Westerners we saw in town, we were once again the only foreigners. There was a sign in English that said we had to enter in groups of 40 and stay with the guide because they controlled the lights and without them we’d be lost in the dark. Right. We let ourselves get shuffeled in with a big group of people, keep in mind, people are staring and pointing and giggling at us the whole time, so it was a bit of a scene, and the tour began. Have I mentioned that the Chinese people seem to LOVE LOVE LOVE fluorescent lighting? I am not kidding, it’s a little like being in Vegas, even in the small mountain areas if they have a downtown. The highways in Shanghai are totally lit up as are many of the big buildings, which usually have patterned lights dancing along the outline of the building. Restaurants show their success with large displays of flashing neon. It’s a bit over the top. This little trend crept into the Silver Caves…the thing was lit up like a disco, complete with running X-mas lights in some areas. 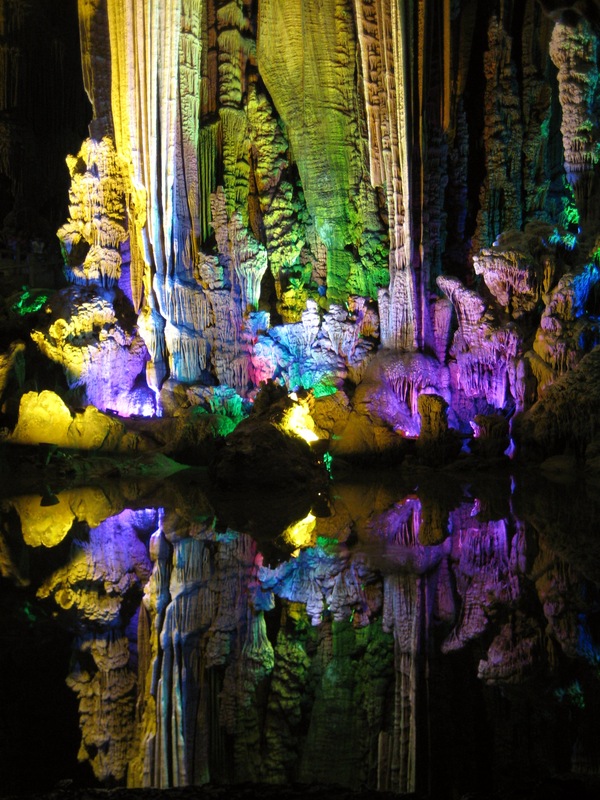 There are all these beautiful rock formations and they are lit up in bright purple, green, yellow and red. 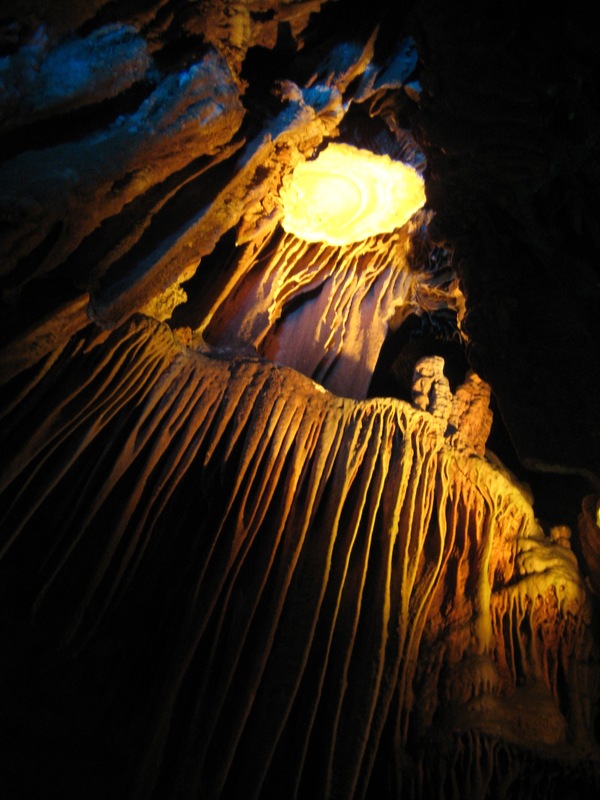 The cave is truly gigantic, and is filled with stalagmites and stalagtites and some other formation that looks like the underside of a mushroom. This formation was huge, more than 15 feet high. There were also quite a few underground water pools that reflected all the colors. The tour took nearly 2 hours, though we have no clue what our guide was speaking about so we spent the time just marveling at the structures and attempting to take a decent picture. The lights reflected nicely off the underground springs. It was pretty sweet, but would have been sweeter without the million people and disco-theme. I would definitely recommend checking it out, but prepare yourself for the masses, and try to find an English speaking guide. 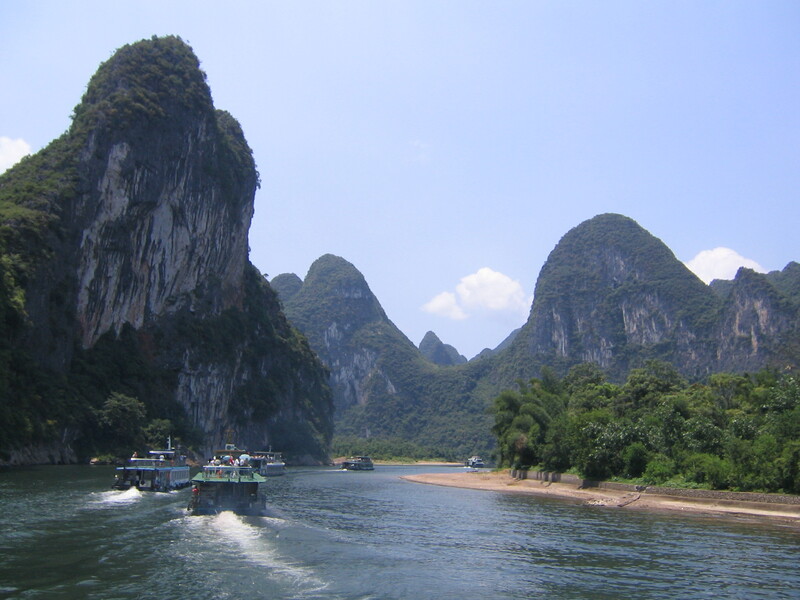 After departing from Xian we arrived in Guilin to spend a mere 12 hours so we could catch an early morning boat to Yangshuo. We were met at the airport by the service staff from the hotel. It was nice of them to pick us up from the airport, but their real motive was to attempt to up-sell us some much more expensive boat tickets. 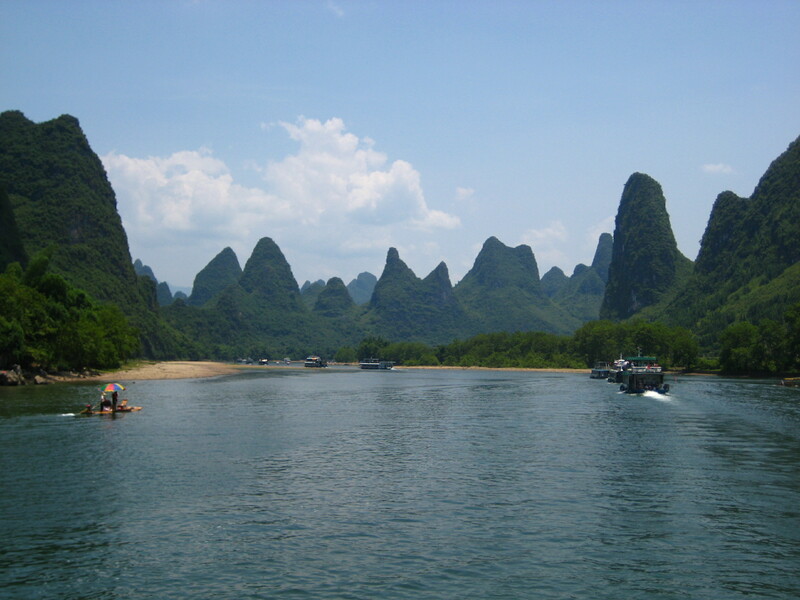 The Li River cruise is an absurdly popular way to see the mountains in this area, and we had pre-booked the basic boat cruise through Jenny’s travel agent. The guy from the hotel tried to tell us that cruise we had already booked was the super-bottom-of-the-line boat filled with drunkards and thieves who would be puking all over the place. He even went so far as to tell us that they hadn’t even sold any tickets for this particular cruise for more than 6th months. He was so full of crap that you could smell it a mile away. We stuck to our guns and he finally, after nearly an hour of refusing to upgrade, booked us the trip we wanted. The boat people came and picked us up at the crack of dawn the next morning and sure enough, all very nice looking people, no scummy drunkards to be seen. The tour was not in English, we were the only Westerners on the bus and so we had no idea what was going on. We might not have even figured out which boat was ours (there were at least 20 boats at the docks and we were left in the parking lot with all our luggage and some sort of instruction in Mandarin and general pointing towards the docks) but luckily there was a young couple from Hong Kong who took pity on us and helped us find our way since they were on the same boat as us. 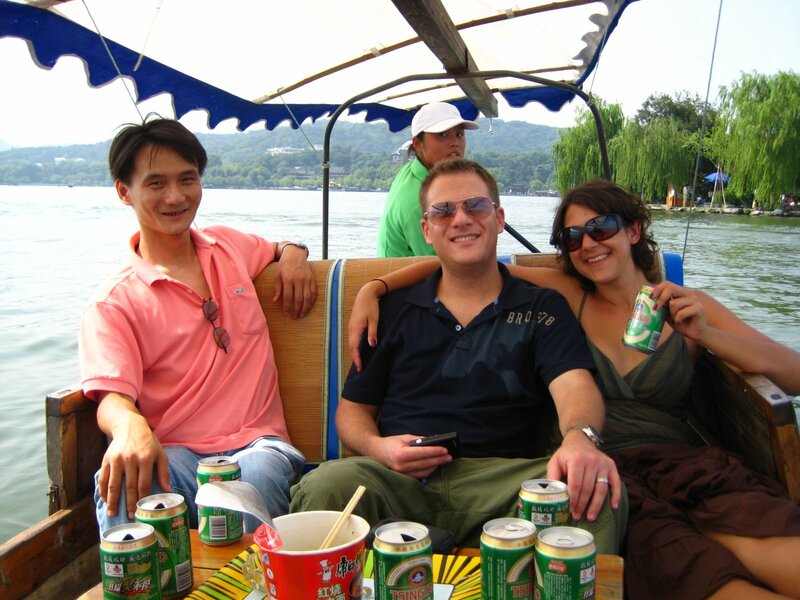 I tend to get violently ill on boats, so I was a little nervous about the prospect of being on one in the middle of China for 5 hours. Fortunately the river was very calm so I survived without any major trauma. We were in a parade of boats. 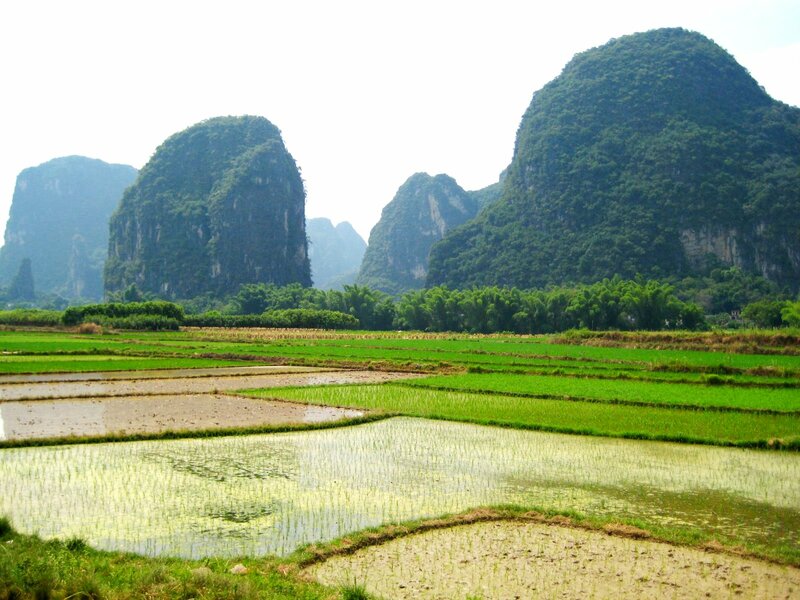 The scenery is really the only reason to take this cruise since you can get to Yangshuo by car in about an hour. There are these crazy mountains all over the place, like huge skinny hills that jut out of the ground. I believe they are made of limestone and interestingly enough look just like the formations in Halong Bay where we went on a cruise with my dad in April of 2010. This area is what is depicted on the back of their 20RMB bills. It’s hard to describe how bizarre these things are, and the photos really don’t do them justice. Spectacular. I have dozens of photos, it's so hard to choose what to post! A massive meal was included. We made it to Yangshuo all in one piece, fought our way through the crowds at the docks, and headed off to our hotel to relax and figure out a plan for the next few days. 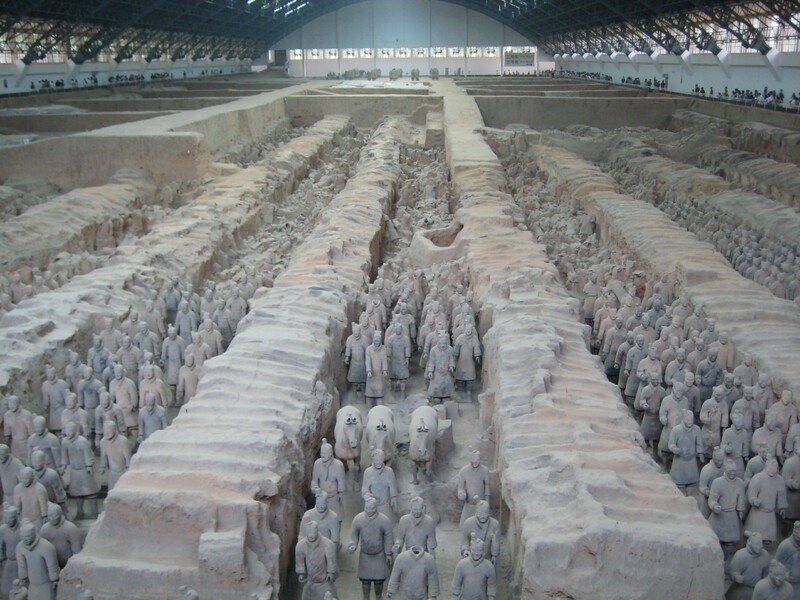 Xian is a small city near the middle of China, and its big draw is the Terracotta Warriors – literally an army made from clay that was buried more than two thousand years ago! 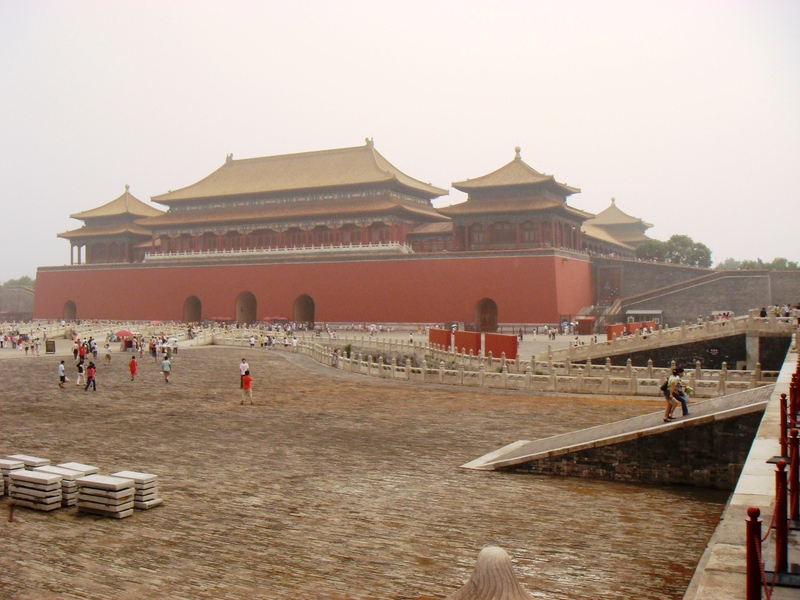 We wanted to take an overnight train from Beijing, but it was completely full – a lesson in booking in advance – so we had to scramble for some last minute plane tickets. We arrived late at night and basically just crashed at our hotel – The Bell Tower Hotel – right in the center of the old town. You could see the actual bell tower from our hotel room. Since we only had one full day to spend in Xian, we decided to hire a driver to take us around because the busses are slow and the tours cost more total for three people than splitting the cost of the driver. Justin looks great in armor! Our first stop was some sort of museum about an ancient group of people called the Banpo. It was interesting, if small, but in retrospect we should have skipped that and gone straight for the main site. We rushed through the next stop – one of the places where they make all the terra-cotta figures that you can buy in the stores/on the streets. This was a bit more interesting because you can buy ones that are life-size so they show you how they make it in 8 separate pieces and fit it all together just before they fire it. Surprisingly there wasn’t a lot of pressure to buy their wildly overpriced merchandise. 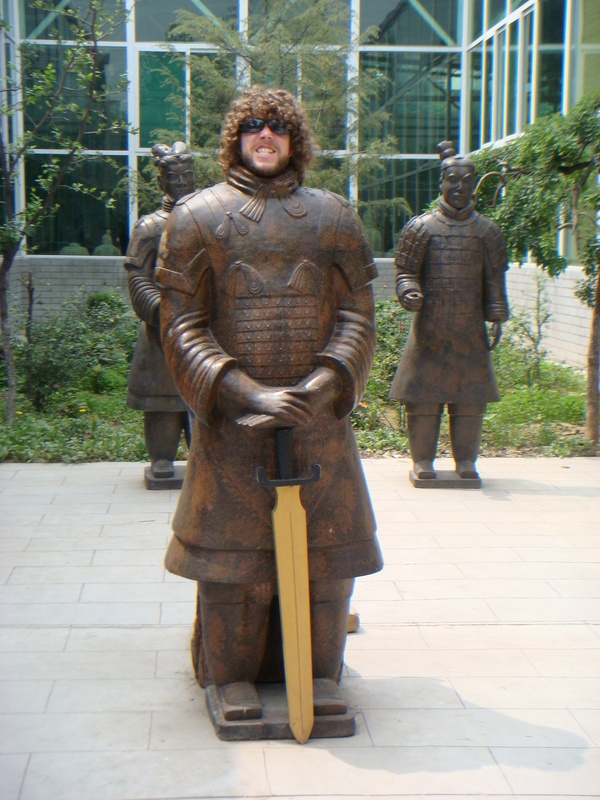 You can however do the very very touristy thing of pretending to be a warrior. Which of course we did. At last we made it to the site of the warriors! The ‘tunnels’ where the warriors were uncovered are still being excavated and they claim that they expect to find at least 8000 total pieces in the first section alone. 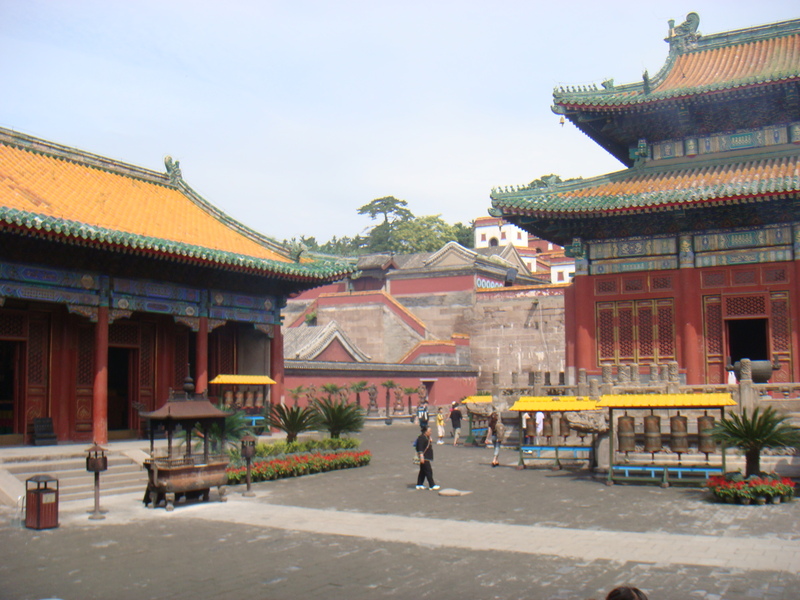 Essentially, the place is a mausoleum for Qin Shi Huang, the first Emperor of China as a united whole. He had thousands of life-size figures, with real weapons, and horses created and placed into a battle formation to ‘guard’ his tomb. The thing is, after it was all done and buried a bunch of thieves broke in and stole most of the weapons and broke a lot of the pieces. 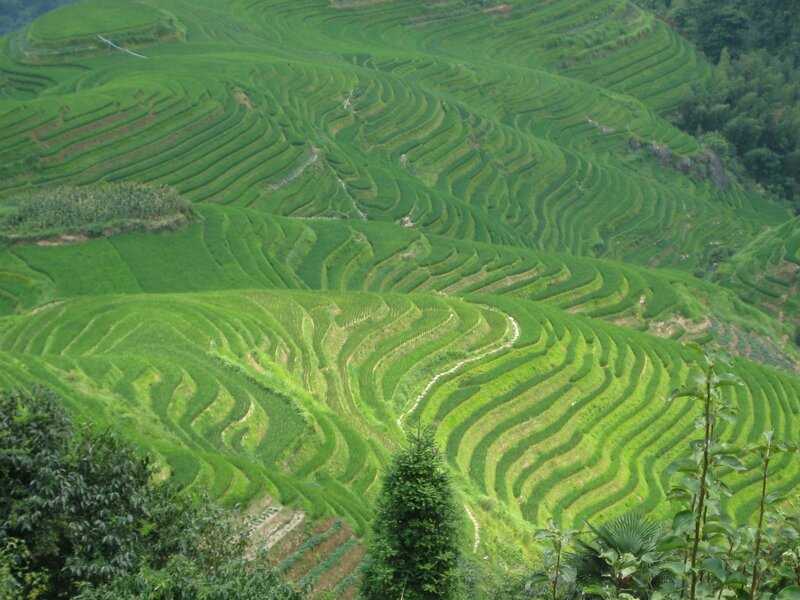 It was forgotten about and not rediscovered until the 1970s when some peasants stumbled upon it! The site is decidedly impressive, they’ve managed to repair a lot of the warriors, but they left some as they found them so you can see what it looked like untouched. All of them are supposed to have unique facial expressions and there are something like 12 different kinds of warriors – archers, foot soldiers, generals, etc. We spent about 4 hours wandering around and honestly, I could have spent at least a few hours more if we’d had the time. This is one of three areas in which the warriors have been uncovered. The next day we had a few hours before our flight so we squeezed in the Big Goose Pagoda (another temple…starting to be templed out at this point…) and then headed back to the center to see the Drum and Bell towers. These were quite interesting, and we had missed seeing the towers in Beijing so we wanted to make sure we saw them here. The drums are HUGE, maybe 15 feet tall for the biggest ones, and there are dozens of them that circle the whole top of the square tower. 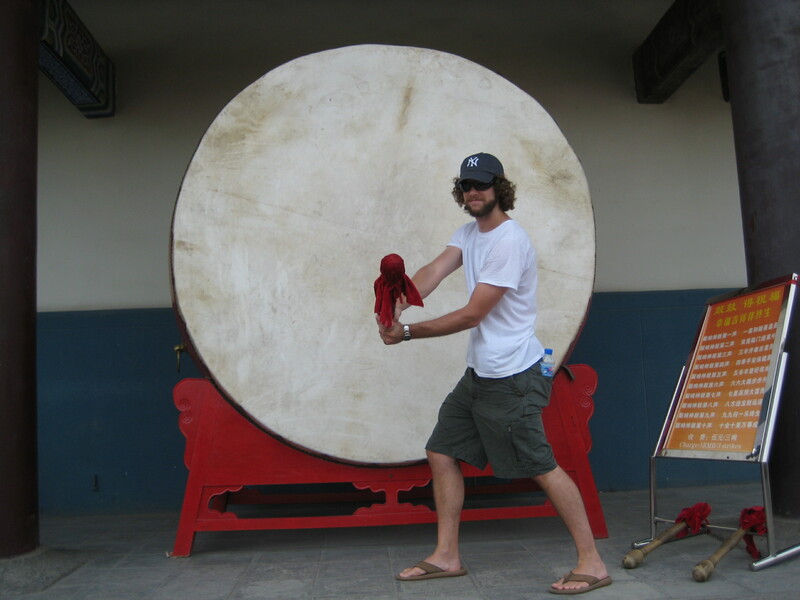 They have a drum show every few hours where performers come out and perform traditional dancing and music. We were lucky to be able to catch one of the shows and it was so loud it made my stomach vibrate. The Bell Tower is basically the same, only with bells. The vibrations from this bell nearly knocked me off my feet! 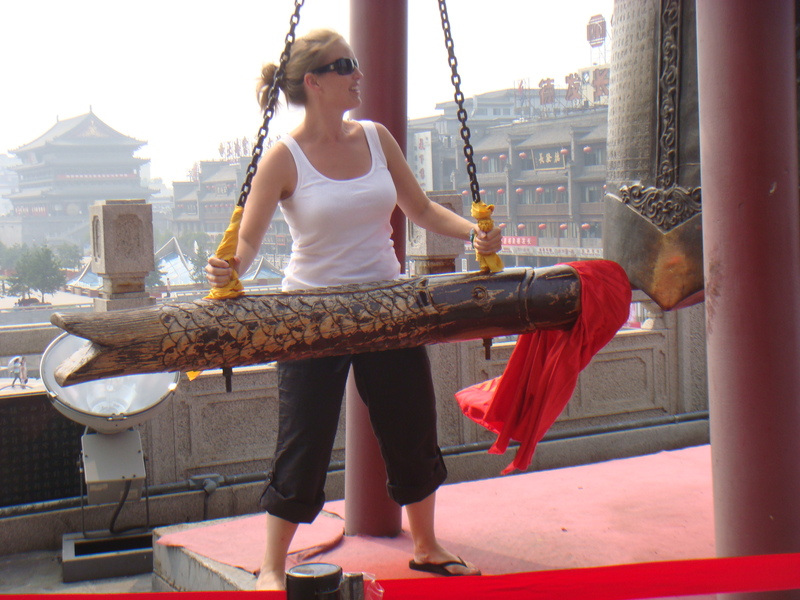 I paid the 5Y to gong the biggest bell three times – also super loud, very fun, highly recommended! 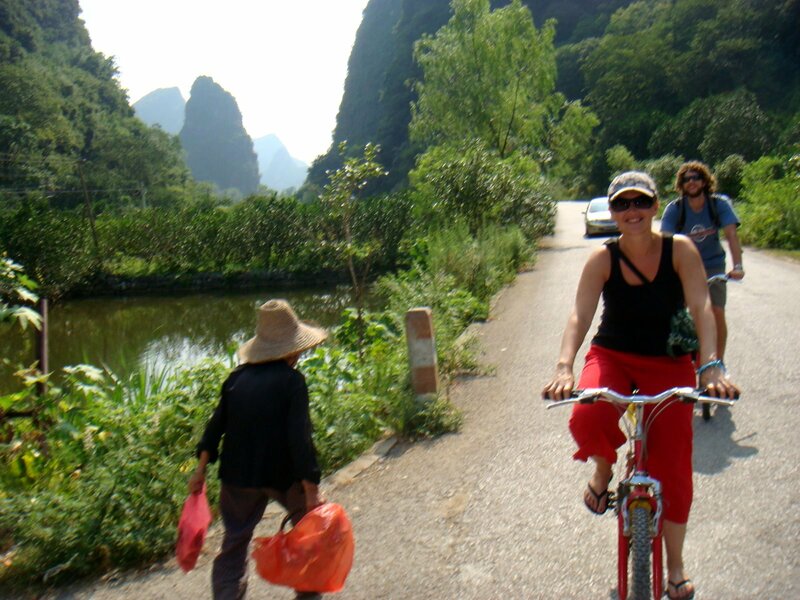 At this point our time was up and we headed off to Guilin to spend a few days in the mountains. It was HOT HOT HOT in Beijing, so at the crack of dawn on our 6th day, we set out for the Chengde – in the mountains about 4 hours north of Beijing. 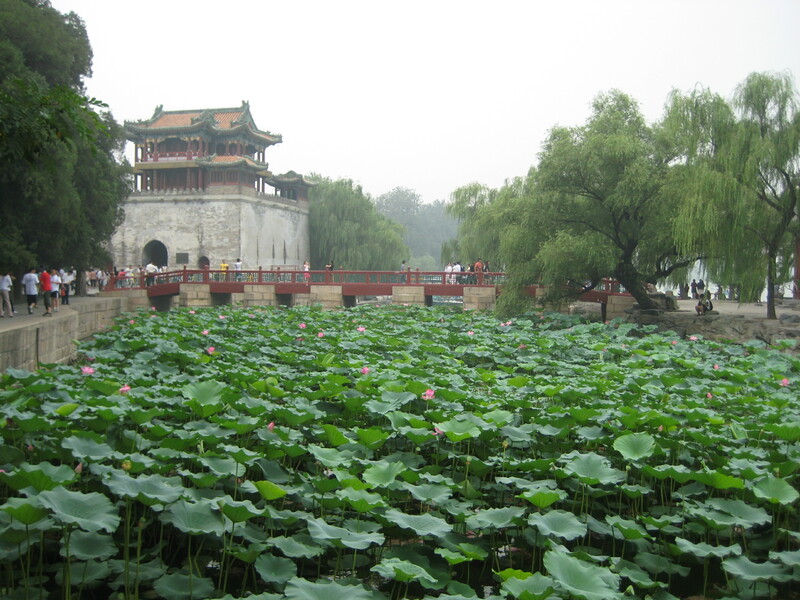 The main reason for heading there was to see the Imperial Summer Resort, which is where the Imperial family would go to escape the insane summer heat of the city. The Mountain Resort itself is gigantic, you could spend days just wandering around the whole site, which comes with its own little wall. We had limited time so instead of hiking the perimeter we took the tram which dropped you off at a bunch of key spots and let you wander about for a bit. There’s one section that has some Mongolian style yurts that you can stay in, which we might have considered doing had we known about it ahead of time. We stayed in an awesome little hotel that is housed inside the grounds of the Puning Temple. The Puning Temple is a functioning (is that the right word? It’s still in use, not just a historic site!) temple with monks still living there. The hotel staff were incredibly nice and were all dressed up in costume. There was a theater in the basement and each night they put on a show about the history of the temple. 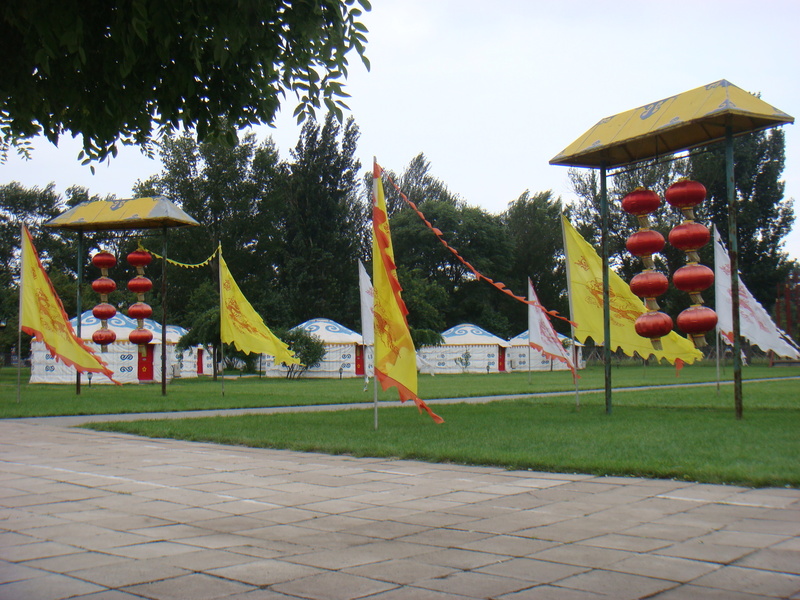 It blew away the terrible Kung-Fu show from Beijing and had some beautiful dances, drumming and music. It was completely in Chinese…so we walked away with a fairly minimal understanding of the whole thing, but it was still great fun. Chengde is a small town to begin with, the the hotel was pretty far off the beaten path so we stuck with the on-site restaurant for dinner. Unlike in Beijing, there were no English menus to be had, and I kid you not, there seemed to be not a single staff member that spoke a word of English. We were also the only Western people at the hotel. This made for an amusing attempt at trying to order food. The staff and other dining patrons were so accommodating that they took us around the restaurant to show us what other people had ordered, and we gestured and nodded and pointed a lot and they seemed to get the gist of what we were interested in. 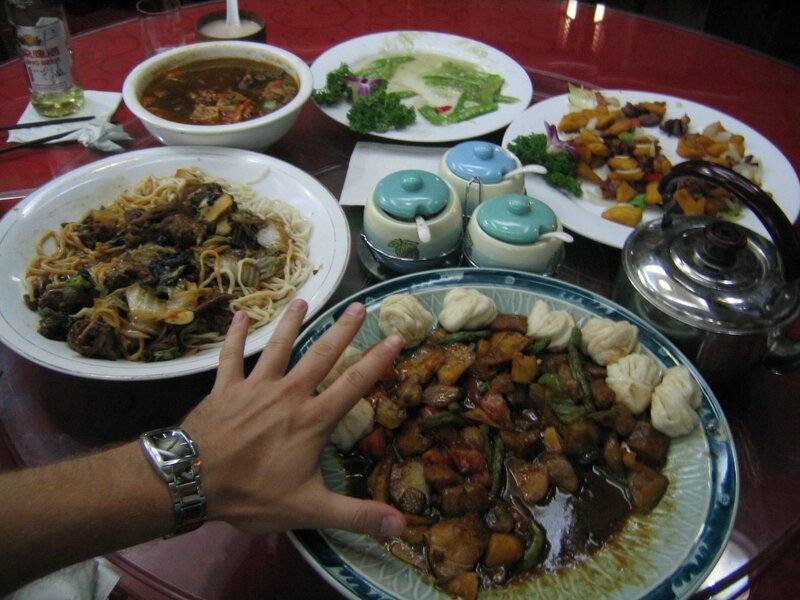 We ended up with a giant meal (Justin had to put his hand in there to show the scale) for only the three of us, and I have only a vague sense of what most of it was, but it was great! This particular temple is my favorite from the whole trip. It had a very calm feeling to it and did not seem like just a huge tourist attraction. 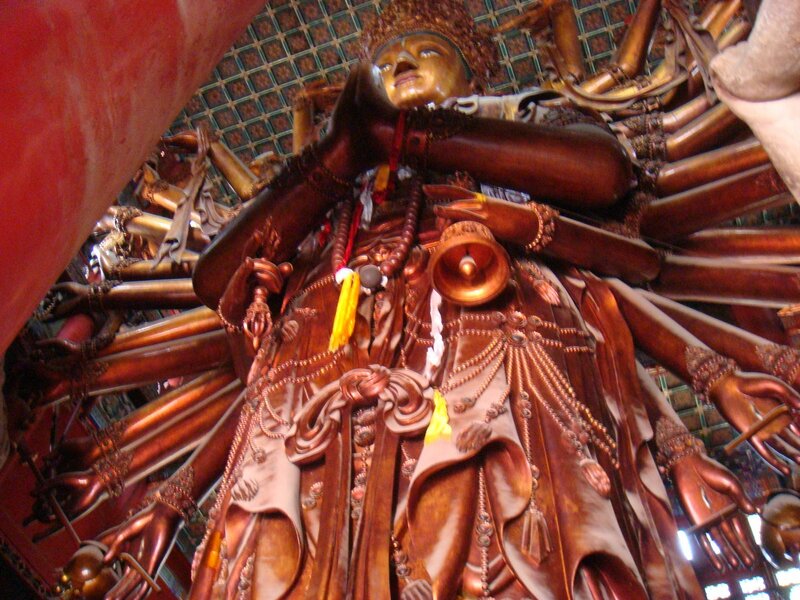 It also holds the worlds largest statue of Guanyin – the Buddhist Godess of Mercy. It is 22 meters high and has something like 42 arms. It was one of the most impressive religious statues I’ve ever seen, akin to the gigantic reclining Buddha in Bangkok. We were only there for 2 days to see the Mountain Resort and the Punin Temple, but you could easily spend more time there and in retrospect I wish we had. 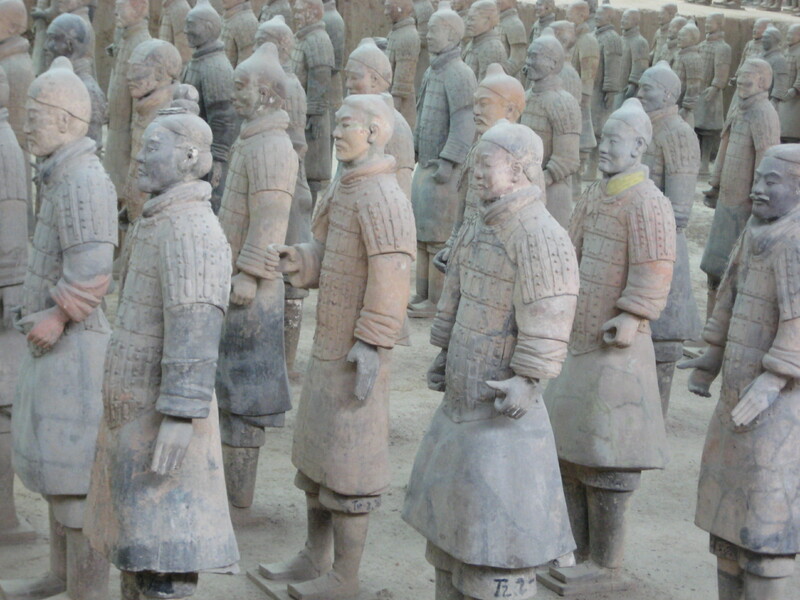 Up next…Xian and the Terracotta Warriors! 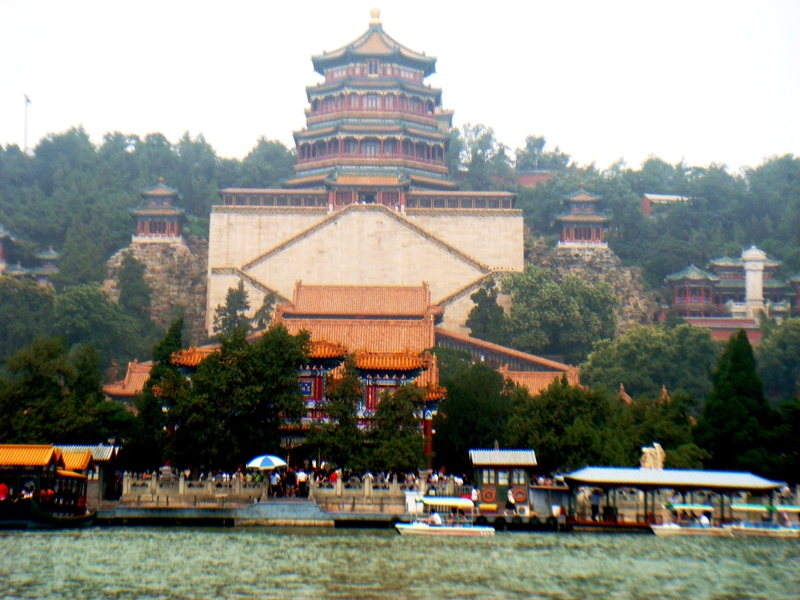 Beijing: Tourist Sites, Nightlife, Shopping! Our excursion to the Great Wall took most of the morning and early afternoon, but back in Beijing we had some time to kill before dinner so we decided to take a rickshaw tour (super touristy!) 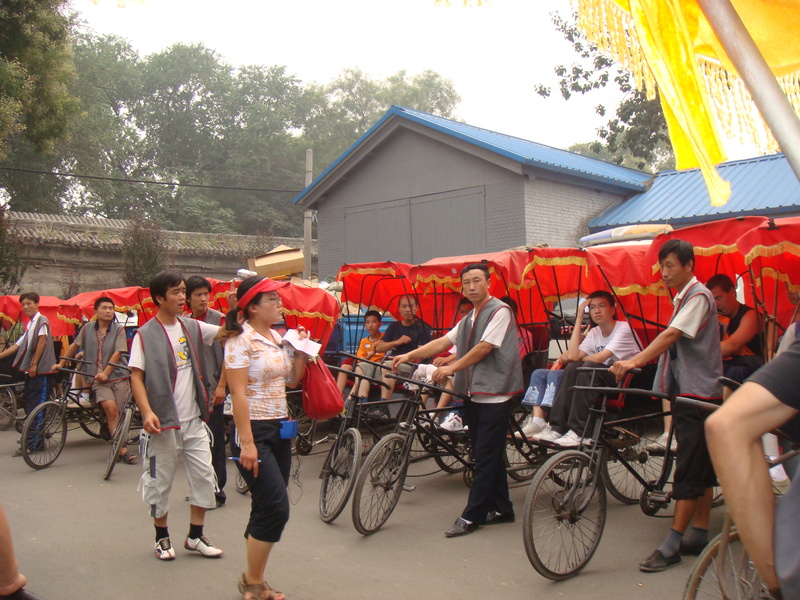 of the Hutong area. The Hutong is the old area outside of the Forbidden City and it is really run down in parts, but nicely fixed up in others – a bit of an imbalance. There’s a big lake that is surrounded with bars and at night they get all lit up with neon (surprise, surprise) and you can rent little boats and cruise around on the lake. That was super fun, so unlike anything else I’ve done while drinking… Following the lead of some local teenagers, we loaded up on the cheapest cans of beer known to mankind at a stand just down the road from the boat rentals. You can get a can for between 15 and 40 cents depending on the brand, and I assume we got the Schlitz of Chinese beer because we went for 15 cent variety. We rented our boat and set off, along with dozens of other people. There were random vendors around the edges of the lake and you could buy fireworks and sparklers from them. We got 10 boxes of sparklers for $1. We spent about 1 1/2 hours cruising around and watching the madness, and then headed back to shore to check out some of the land-nightlife. There may have been karaoke, strobe lights, and John dancing on a pole…but I can’t be completely certain. 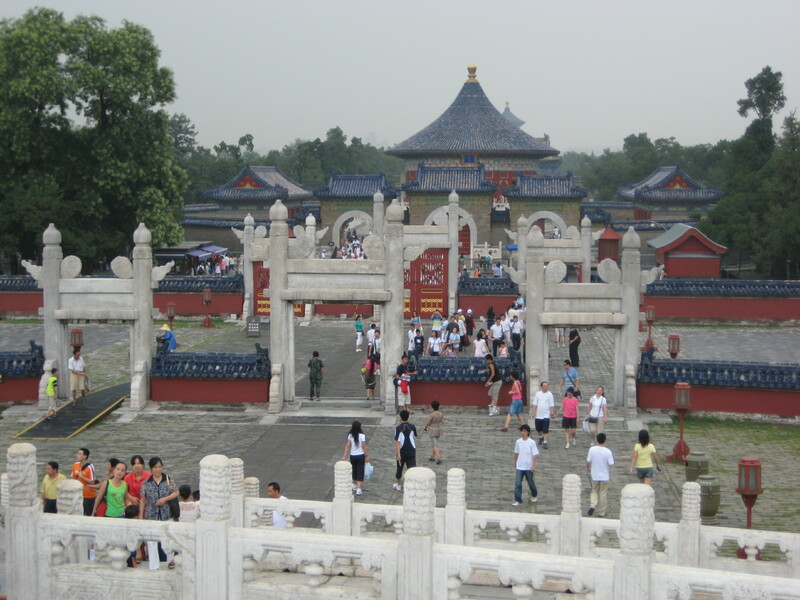 Of course, Beijing has all the traditional sights as well – The Forbidden City, Summer Palace, Temple of Heaven, Tiannamen Square, Behai Park etc. 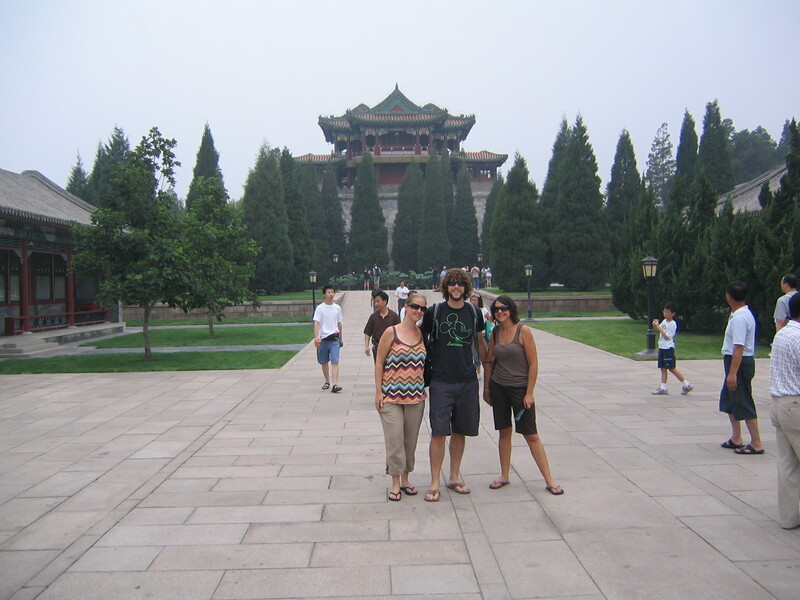 We saw all of them, but our favorites were the Summer Palace and the Temple of Heaven. They were both set in huge parks so you could get away from the heat if you went into the trees. Did I mention it was A MILLION DEGREES? Really, you think I’m kidding, but I’m not. The buildings have mostly been redone and look very sparkling new – it’s amazing how much detail some of the places have. Tiannamen Sq. looks exactly like it does in the movies. We tried to go to Mao’s Mausoleum, but it’s closed at the moment, super bummer. We did however see some sort of military marching drill that was at once fascinating and a little scary. Fuzzy, but the best that could be done at the time. The lake in the Hutong is lined with bars and clubs, all attempting to lure you in with their amazing display of neon lighting. Everyone, seriously, EVERYONE is out on a boat at night. There was some serious traffic trying to get under the bridge. 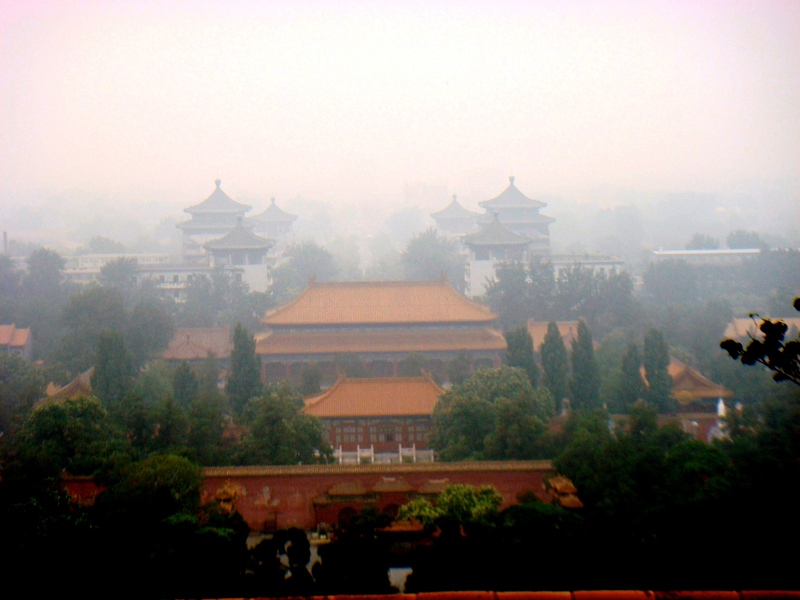 The Forbidden City from a nearby park. Again, the smog obscures the photo. 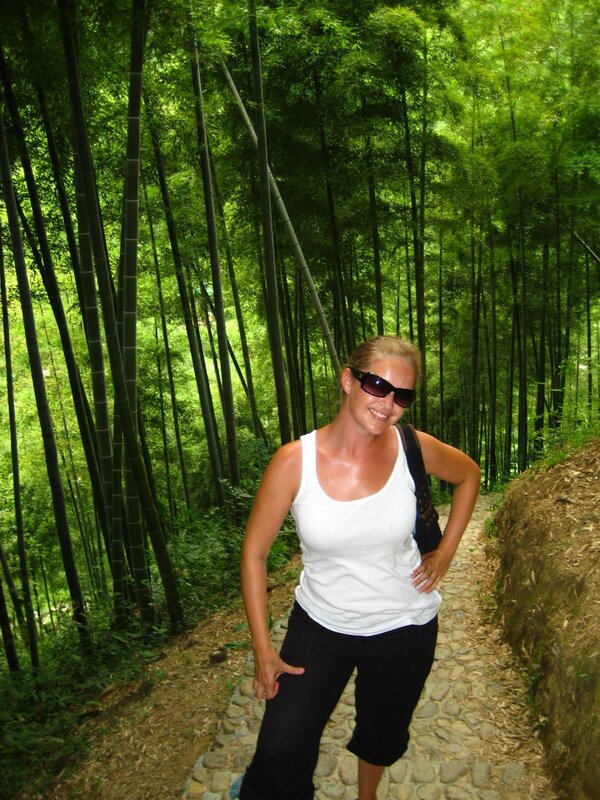 You can’t take me to a city without taking me to the shopping, and Beijing was no exception. We spent a whole afternoon at the largest outdoor market I’ve ever seen. On the evening of our last day we went to go see a Kung Fu show. It was probably one of the most ridiculous things I’ve ever seen – totally made for Western tourists, but super funny all the same. There were some good Kung Fu actions, but the story (about a young monk named Kong Kong who works hard to become a Kung Fu master) was absurd and the acting/dancing/costumes/effect were terrible. I am glad we went as we have some amusing photos, but overall a bit of a waste of $$ despite how much the guidebooks hype it up. 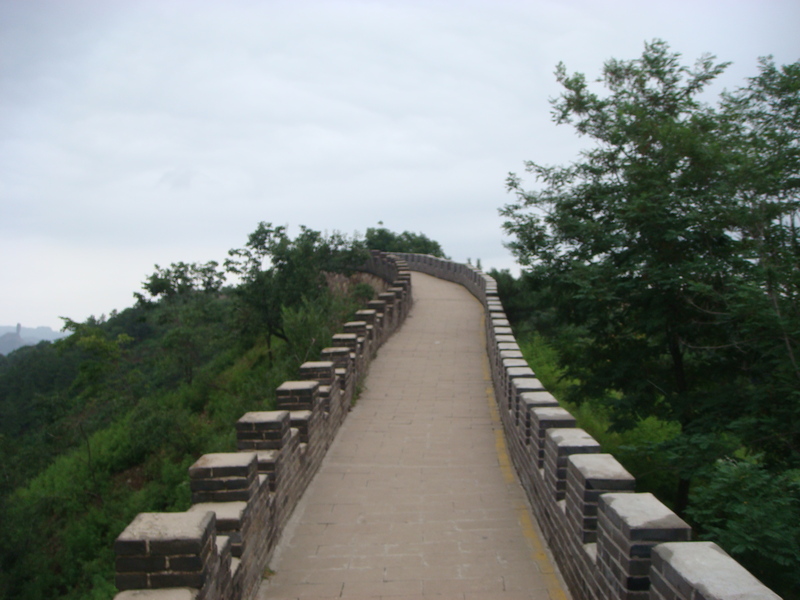 We spent 5 full days inBeijing plus a day at the Great Wall and that seemed like a good amount of time. We encountered a few local English speakers, but for the most part we got by with our minimal phrases, a lot of charades, and loads of smiling.